Lines, crowds and stress — if that describes your holiday shopping experience, you’re doing it all wrong. The cost of gifts and decorations can add up quickly, but there are plenty of ways to reduce the dent in your wallet. From your nearest and dearest to coworkers and teachers, write down everyone you need to shop for and assign a dollar amount next to each name. Online gift guides, like The Home Depot’s Holiday Gift Center, make it simple, with gift ideas categorized by price point. This will help you stay organized and setting price limits will keep your budget on track. Collect all the ads from your favorite stores and use them to create your shopping plan of attack. When the day comes, get to the store early for the best selection and savings. At The Home Depot, these ads are also located on the online home page, and many items are also available for in-store pick up or delivery. 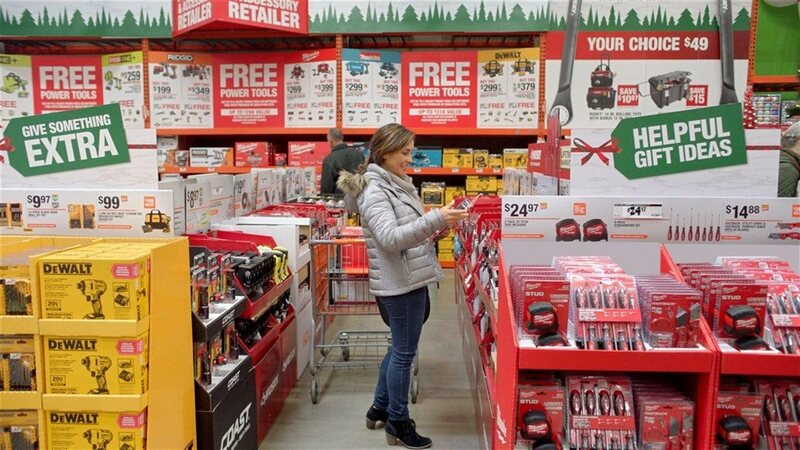 The Home Depot has many holiday deals, which kick off on Black Friday, including Special Buys on power tools and accessories from Milwaukee, Makita, Ryobi, Ridgid and DeWalt; Mechanics Tools Sets and Storage from Husky; Smart Home products from Google and Nest; among others. Check online for your local store for hours and availability. The easiest way to overspend on holiday gifts is to wait until the last minute. Shopping at the latest possible moment adds unnecessary stress. For the people on your gift list who are impossible to buy for, a Home Depot gift card is a favorite that’s sure to get a smile. With so many tools to help you shop, you can get your shopping done quickly and spend more time with family and friends. Check out your favorite brands on social media, where you can likely find up-to-the-minute info on savings right in your news feed. Many companies post special promotions, news and last-minute sale announcements every day, especially during the holidays. The Home Depot keeps its deals updated daily online, including up to 40 percent off select power tools and accessories and up to 40 percent off appliance special buys. Before you head back for seconds of Grandma's desserts, finish your wish list. Mobile apps, like Home Depot’s mobile shopping app, make it easy to search for your favorite items. If you find a gift in store that breaks your budget, use your phone to search for a better price elsewhere. Some stores will price match if you show them another retailer selling the same product at a lower rate. An online item might seem like a steal compared to the in-store version — until you see the shipping charge. Remember to take note of any extra delivery or service fees, as well. Many retailers offer free, fast delivery on many items; for example, The Home Depot will offer free shipping on all Christmas décor and live trees this holiday season. Follow these tips to accomplish all your holiday shopping goals and get back to enjoying the season with loved ones. For more tips, visit homedepot.com/c/black_friday_savings.